A legendary company, a Greek legend, blue funnel steam ships were a colourful lot in more senses than one. 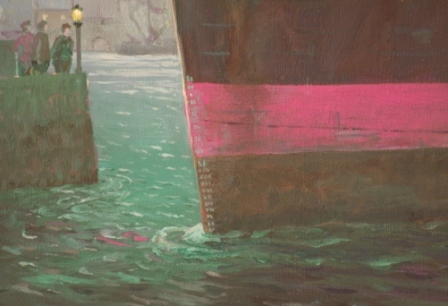 By Gordon Frickers, measures 40 x 60 cms, (24″ x 16″), oils, sold to a private collector. However at this time we have one remaining ‘Blue flue’ in stock, ask for details. Shows the ‘Blue Flue’ Talthybius docking her home port of at Liverpool. 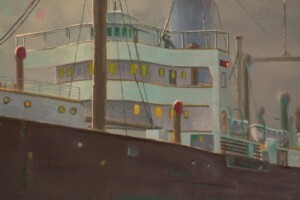 Gordon Frickers started this marine painting inspired and encouraged by his good friend and supporter Harry Milsom, former editor of Sea Breezes, some 15 years ago then abandoned it, unfinished. In 2009 having been invited to exhibit his work at the European Parliament, Brussels, while sorting out paintings at his studio in SW France at Itzac in the Midi Pyrenees, Gordon Frickers rediscovered several unfinished works. Re inspired by the fabulous moon rises and night skies often seen over that part of France this painting returned to his easel and quickly found a buyer. Built 1912 by Scotts Shipbuilding & Engineering Co, Greenock, 10,224 gross registered tonnage. An uneventful career until 1941 when at Liverpool she was hit twice by bombs on May 4th and 8th. 1942 ~ Talthybius was again struck by bombs. This time at Singapore, the perpetrators being the Japanese. Holed and on fire, her Chinese crew abandoned her. Her British officers extinguished the fires and moved her to a dry dock where they attempted to plug her holes. The order to abandon Talthybius was reluctantly obeyed on February 12, 2 days after it was given. The master and officers escaped the advancing Japanese who seized Talthybius on the 16th and sent her to sea as the Taruyasu Maru. 1945 ~ On the 30th of June Taruyasu Maru ex Talthybius struck an American mine at Toyama bay North of Honshu. Her crew managed to beach her at Maizuru Harbour where she remained until after the war. She was raised and repaired, putting back to sea as Empire Evenlode managed by the (British) Ministry of War Transport. 1948 ~ Hong Kong, Dec 1, placed with Alfred Holt & Co (of Liverpool) who sent a master and officers (by air) and hired a Chinese crew. Upon this her return to her fleet she was said to have had her funnel painted with affection, “the best shade of blue available”. At Seletar Naval Base she loaded with scrap iron and steel, war debris for a voyage to England. With her Suez Certificate lost and no chance of another she headed for Durban and the Cape of Good Hope. She had to put in to Mombassa for new boiler tubes and stopped again at Cape Town for more of the same. 1949 ~ Talthybius finally made Swansea on May the 8th having spent some of the voyage moving so slowly she displayed 2 black balls (indicating, technically she was not under way). After the discharge of her cargo of scrap she herself became scrap, and thus, history. The history of this company is deeply enmeshed in the history of the British merchant marine. From 1865, The business of The Ocean Steam Ship Company prospered, to grow eventually to include Nederlandssche Stoomvaart Maatschappij “Oceaan”, the China Mutual Steam Navigation Company, Thomas Royden and sons (New York), the Knight Line, Cowie and Company, and in particular the Glen Line (All ships names pre fixed with “Glen”) which in turn added the Shire Line forming a company of some 90 merchant ships. 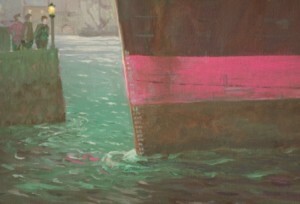 Not all these ships had the renowned ‘blue flue‘. The Glen Line and Nederlandssche Stoomvaart Maatschappij ~ NSM “Oceaan” ships sported red black topped funnels however their livery was otherwise identical. 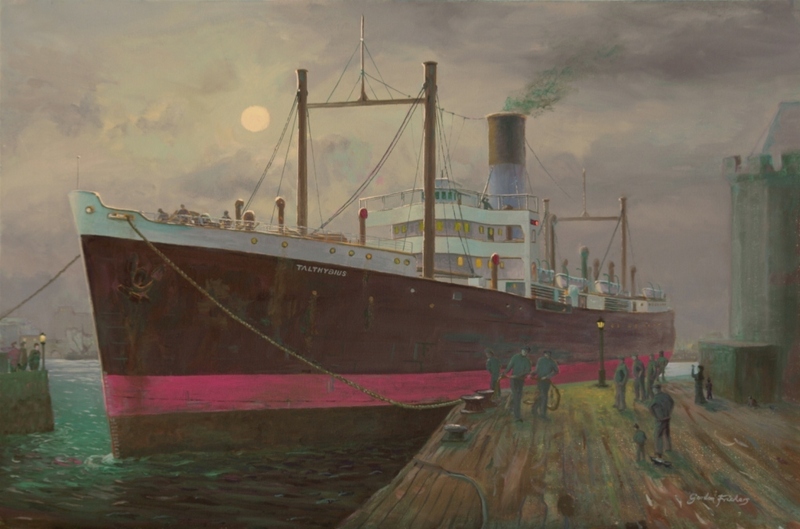 The phrase “Blue flue” was much in use around ports world wide, in such popular usage the some 100 years after the founding of The Ocean Steam Ship Company, Blue Funnel Line Ltd became a registered company name. Together they made a real contribution to the prosperity of the world we have inherited and to Britain in particular. There was a price to pay, the stout ships and their brave crews endured much hard work, long voyages and storms and proved especially vulnerable during the 2 world wars. 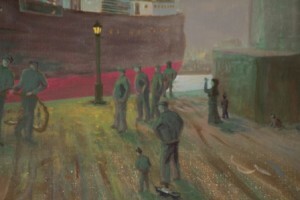 The Gordon Frickers artist was fortunate to meet some of the former officers and visit the offices of The Ocean Steam Ship Company in Liverpool before the company finally ceased to manage ships. The name Talthybius has also been given to one of the asteroids of the planet Jupiter. Talthybius had an important role early in the tale of Homer’s The Iliad, the Greek version of the Trojan War. If you are not familiar with the Iliad, here is a brief intro to the opening scenes. Talthybius appears as a faithful if reluctant squire, diplomat and an ambassador for King Agamemnon. The Iliad opens with King Agamemnon in dispute with Apollo over a mistress. The drama increases when King Agamemnon decides in frustration to steal Achilles captive girl Briseis as a substitute. Achilles is not amused in fact he is seriously angry with this injustice. Achilles went to sulk in his tent and thus deprived the Greeks of their foremost champion during the Trojan War. Solution, a rather unenthusiastic Talthybius with Eurybates were sent to fetch Briseis, their task to bring some order into a disordered world. Happily for Talthybius and Eurybates, Achilles receives them gracefully and gave up Briseis. Did anyone ask Briseis what she wanted? Brisēis was a Trojan widow who was abducted during the Trojan War by Achilles after the death of her three brothers and husband, King Mynes of Lyrnessus. Talthybius is hardly mentioned again in the Iliad, he does though appear in the notable play, “The Trojan Women” by Euripides. Talthybius is said to have died at Aegium in Achaia where his descendants became heralds and allegedly still live. 4. Visit to the offices and archives of The Ocean Steam Ship Company, Liverpool.